Most of the videos plays smooth on tv . But h265 encoded videos(x265 HEVC) are not playing. Nowadays all movies/tvSerials/bluerayDiscs are streaming in h265 codec format but its not playing in lg tv. H265 encoded videos plays smoothly on DivX player and Lg TV have DivX compatibility. We have mentioned that no LG TV, except some 4K models, supports H.265 codec video. 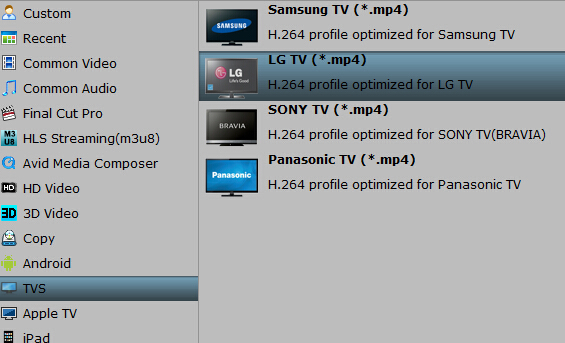 So if you have some H .265 codec movies, TV shows and Blu-rays and want to play them on LG TV, you’d better transcode H.265 to H.264 with H.265 Converter. 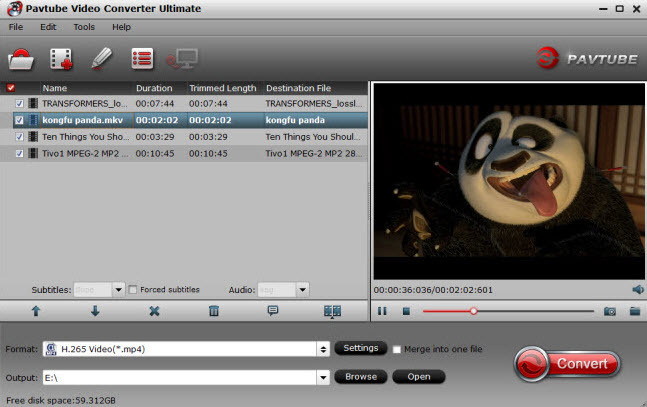 Searching for H.265 converter on Google search engine, Pavtube Video Converter Ultimate is a top-ranked one. It can transcode any H.265 videos, including 4K, to LG TV supported video format with excellent video quality. If your LG TV is not 4K model and you have some 4K videos, it even can compress 4K to 1080p/720p for your normal LG HD TV. For those who are not good at video conversion jog, it offers the optimized preset for the mainstream TV brands, such as LG/Samsung/Sony/Panasonic so that you don’t need to adjust the video/audio parameters on your own. More functions are in the review. How to transcode HEVC (H265) to H.264 video for LG TV? The following snapshot tutorial is based on Windows computer, if you are using Mac, please use the right Mac version (El Capitan supported). Step 1: Add H.265 videos. Run the program, click “File” menu, from its drop-down option, select “Add Video/Audio” to load H.265 video to the program. You can also simply drag and drop the source video to the app interface. It supports batch conversion which allows you to add more than one video at a time. Navigate to “Format” > “TVS” > “LG TV (*mp4)” as the target format. Or if you have usage for these output videos, you can choose H.264 MP4 format. Tip: Generally, when you chose the optimized preset for LG TV, you don’t need to adjust the video and audio parameters again. But if you have some special needs, or you chose another format in step 2, you can click “Settings” to open the settings profile window to make some adjustment. Now hit on the “Convert” button on software main interface to start the H.265 to H.264 for LG TV conversion. When it finished, just open the output folder to find the generated video. Simply, you can store these converted H.265 video to personal cloud storage or HDD then stream them on LG TV. If you plan to buy the program now, you can get it at $52, original $65, for Pavtube Chritmas Coupon. How to Play HEVC/X265 video on Samsung Smart TV? Useful guide. Thanks for sharing.